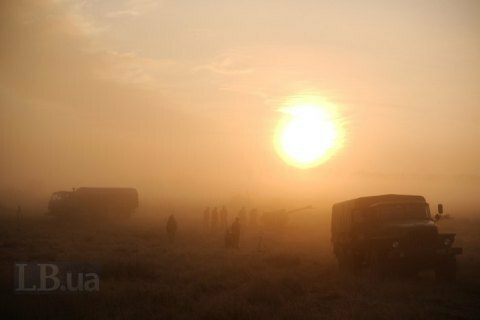 Militants continued to use banned heavy artillery. Three Ukrainian servicemen were wounded and two sustained combat injuries as the Russian occupying troops carried out 52 attacks in Donbas, according to the antiterrorist operation (ATO) HQ press centre. In the Donetsk sector, militants fired with 120-mm mortars, infantry fighting vehicle guns, grenade launchers and small arms near Novotroyitske, Lebedynske, Verkhnyotoretske, Krasnohorivka, Pisky and the Butivka mine. They used grenade launchers of various systems and small arms repeatedly near Avdiyivka, Maryinka, Vodyane and Kamyanka. Snipers wee active near Novomykhaylivka and Maryinka. In the Luhansk sector, the occupiers fired with 120-mm mortars, heavy machine guns and antitank rifles at the ATO strongpoints near Zaytseve. They also used 82-mm mortars, grenade launchers of various systems, machine guns and small arms near Zolote.